In the 1990’s Deloitte and Touche were awarded a multi-million rand contract to restructure the South African National Defence Force (SANDF) into a more efficient and economical force. What resulted was a ‘silo’ structure of various formations within the SANDF, ranging from armour to air defence. Although successful in trimming the costly SANDF and allowing a decent amount of post-apartheid integration of the armed forces, the new structure was awful in a military sense. The structure created a bloated and unwieldy force structure that was wholly unsuited to any sort of defence function beyond protecting South Africa from immediate invasion. less publicised cracks must be accounted for in the lack of range time, training and live fire exercises by all branches of the military. The Air Force want airlifters and money for gas, literally. But in the 90’s this was an acceptable tradeoff. The 1998 defence review dictated a withdrawal of South Africa from African defence affairs. Whether to avoid the appearance of yet another Angola or the projection of a bullying new South Africa is unimportant from the point of view of the management structures of the SANDF. What it meant in real terms for the men in uniform was that their new compartmentalised structure fit the foreign policy aims of the state, and the budget accorded it (and it wasn’t generally much better then) was deemed appropriate for the time by government. But this is 2014, and the SANDF is now battling to adapt its Deloitte and Touche force structure to a newfound role – and apparent expertise – in expeditionary interventions at the behest of the United Nations. The 2014 budget allocation does not cover the real inflation rate, meaning it now must do more in its post-apartheid history with even less. ‘Making do with less’ has always been one of the more remarkable feats of professional defence forces, but in South Africa the cuts are simply too much to absorb in the SANDF’s current form. 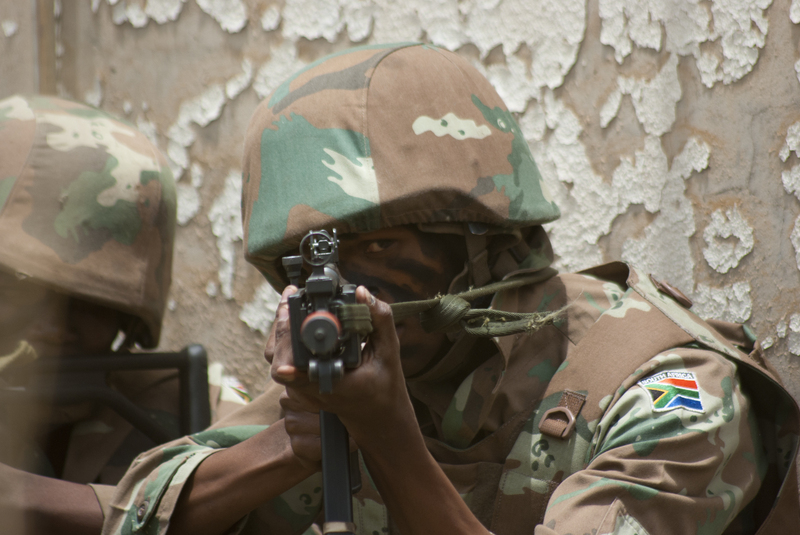 To compound matters, the 2012 defence review represented a coherent and eloquent plan for the SANDF’s future organisation and role. It fell in line with foreign policy objectives and remained realistic about what it could and couldn’t do. But this was assuming the defence force would receive a substantial increase in funding, unofficially to around 2% of GDP. Which simply has not happened. As such, the military is now stuck between a rock and a hard place, having officially advocated what is essentially a three division force that will deploy on expeditionary operations in Africa, broadcasting an array of sophisticated capabilities, whilst still maintaining a strong national defence posture, but with the same budget it had ten years ago. Nobody in the position to adjust defence policy is being honest about what needs to be done on the SANDF. So where does this leave the South African Military? The rot has set in, and the SANDF is beginning to show cracks at the edges. The cutting of flight hours for fighter pilots and the heavy reliance on charter strategic airlift are flashy reminders of this. But less publicised cracks must be accounted for in the lack of range time, training and live fire exercises by all branches of the military, and the constant scrabble to legitimise large acquisitions at the expense of other branches of the service. The Air Force want airlifters and money for gas, literally. The Navy want ships to fight imaginary pirates in Mozambique and, more legitimately, combat domestic maritime security issues such as poaching. For the Army it’s a basket of needs ranging from the replacement of 50-year old trucks to the constant need for training and exercises to keep troops at a professional level. Nobody in the government position to adjust defence policy is being honest – at least to the press – about what needs to be done on the SANDF. There is no searching question about whether to fund the military that the 2012 defence review describes, nor to think about a plan B: perhaps sacrificing a lot of decaying capabilities and restructuring the SANDF in a more sober and honest way. The senior officers understand the requirements asked of them, and have been constantly attempting to spread the butter over an increasingly larger piece of toast. Media and government have applauded the fantastic efforts of SANDF troops and aviators in the DRC, launching attack helicopter sorties against targets with precision, troops securing the Eastern DRC in a peace operation whose success many local Congolese have never before seen. But ultimately the attack helicopters will need upgrades and further training, the troops will need to rotate out, upskill and drill harder for future fights, and all of these things will cost money that simply isn’t there.